As a Tennis SA Member, your Club has the ability to run ANZ Tennis Hot Shots programs, FAST4 Tennis and Fitbit Cardio Tennis. Suitable for any skill level and fitness level, Fitbit Cardio Tennis is all about burning calories, increasing your fitness and improving your game at the same time. 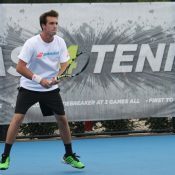 ANZ Tennis Hot Shots is the fun and easy way to get started in tennis. A simple and exciting way of speeding up a conventional tennis match.